While the collecting of rugs has only become popular in the last century, many nobles, kings and emperors have shown great interest in handmade carpets for thousands of years. Unfortunately, many Oriental, Persian and Turkish rugs are not equipped to last beyond a few generations, regardless of how extraordinary their craftsmanship and materials are. Even with impeccable care, rugs will undoubtedly deteriorate over time, which is why we have so few remnants from a worldwide history that is seemingly littered with these stunning, handmade articles. Today, we look at some of the most notable carpets throughout this remarkable history, and give but a brief background on where they originated. 11th-13th century Turkish Carpet from The Museum of Islamic Art in Qatar. Most Turkish carpets are made in Anatolia or nearby areas, with the art dating as far back as the pre-Islamic era, and featuring much of the Turkic history as a result. Typically made of both wool and cotton, Turkish rugs use the Turkish knot when being manufactured – a symmetrical knot when compared to the asymmetrical knotting of Persian carpets. Though weaving has declined in the area somewhat since the second half of the 19th century, rugs made in villages, tribes and by nomads have been discovered from as far back as the 13th century. New initiatives in the region, however, are beginning to revive the art, and with it, the Turkish rug is making a slight comeback in terms of quality and notoriety. 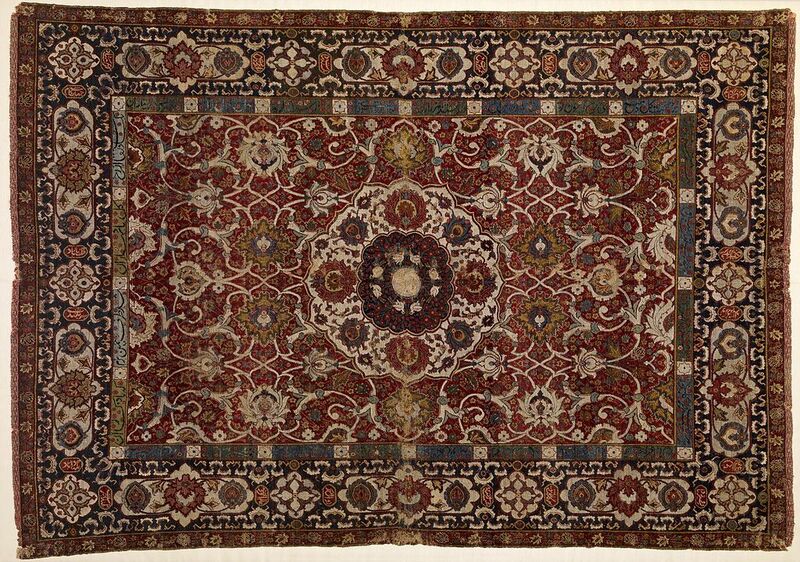 Mid-16th century Tabriz Rug, also known as the Rothschild Small Silk Medallion Carpet, at the Museum of Islamic Art in Qatar. Of all the rug producing countries in the world, none have as rich of a history as the area of Persia, or modern day Iran. The weaving arts have been so ingrained in the culture that Persian rugs have become synonymous with handmade carpets themselves. In fact, some of the most notable carpets throughout time have come from this region, including the Heriz, Hamadan, Senneh, Sultanabad, Isfahan, Qom and Nain among others. Much of this is due to the profound focus ancient Persia and now Iran has put on creating incomparable works that only utilize the best materials, workmanship and natural dyes. 17th-18th century Mughal carpet from India, known as the Millefleurs Star-Lattice carpet, which sold at a Christie's auction for nearly $8 million in 2013. Ancient Persia had a tremendous influence on India’s culture centuries ago by bringing carpet weaving to the area, which quickly blossomed into an equally significant art among the Indian population. Beginning roughly in the 16th century, it wasn’t long before India became well-known for its contribution to handmade rugs, particularly as a result of their having developed a style all their own that rivaled others in terms of quality and craftsmanship. As you can see above, the Mughal carpet, made in the 17th-18th century while Mughal Empire rule was still in existence, displays some of the most intricate and exquisite work ever displayed, making it no wonder why this Indian tradition continues to this day. Want to see even more of these striking rugs in person? Visit our showroom to speak with one of our experts on the history and beauty of these handmade wonders.